Perhaps you drive by the old Marine Hospital on Fairhill on your way to or from work. 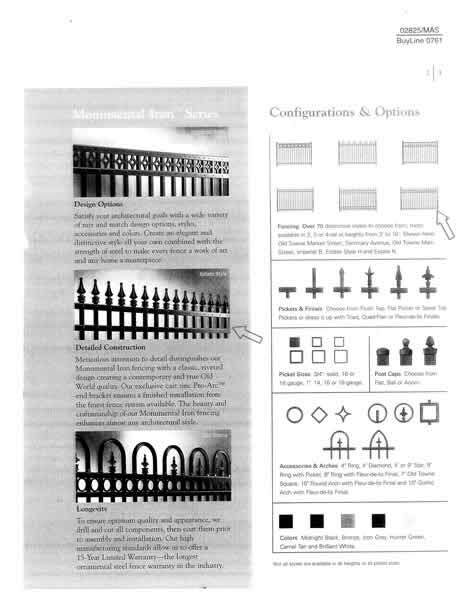 You may have noticed a wrought iron fence that appeared in front of a staircase and wondered what it is. I did - I was curious how this staircase related to the complex, which is a Cleveland Landmark. Until recently, this is what you would have seen from Fairhill - a concrete wall, presumably just a retaining wall. The style of the staircase seems consistent with the rest of the complex, but if so, why was it buried? The postcard shown below may help to answer that question. This illustrates the staircase as it was near the time that the complex was built, in the 1920s. It appears to form a sort of grand entrance to the complex. What happened to the building shown here? Was it demolished? No, it is still standing. The building shown in the first photograph was built in front of it. This changed focus of the complex likely made the staircase from Fairhill unnecessary. The recent excavation of the staircase helps tell part of the visual narrative of this complex. It makes the space more appealing from the street, too. The wrought iron fence was likely added as a safety measure. 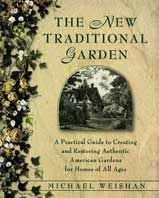 The New Traditional Garden : A Practical Guide to Creating and Restoring Authentic American Gardens for Homes of All Ages by Michael Weishan (Ballantine Books, 1999). This might not be the book you'd want to consult if your house was built during the 20th century (particularly the mid-20th century, as the author is pretty vocal about his disdain for 1950s architecture and landscape design). But for 19th century homes -- such as those in Ohio City -- The New Traditional Garden might be a good bet. 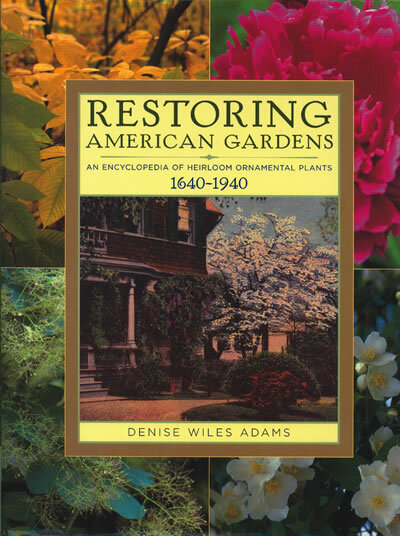 Restoring American Gardens: An Encyclopedia of Heirloom Ornamental Plants, 1640-1940 by Denise Wiles Adams (Timber Press, 2004). To compile this comprehensive volume, Adams used a database of 25,000+ plants and hundreds of historic gardening catalogs to recreate 300 years' worth of American gardening trends. Another good way to find historic gardening information is to look at books and magazines that were published around the time your house was built. Cleveland Public Library has numerous titles -- such as Better Homes and Gardens -- in print and on microfilm. Search the online catalog for the subject "gardening -- periodicals." Cleveland may not be the happiest, richest, or best-educated city in the country, but darn it, it's a great place for people who love books -- I've lived in four different states, and let me tell you, we've got some of the best used bookstores in the country. Check out the selection of antiquarian gardening books at places like Loganberry Books and the $2 Rare Bookstore. Or, if you don't feel like leaving home, don't overlook Google Books as a good source for historic gardening information. Use the Advanced Search to limit by date; simply type in "gardening" or "garden" as your generic search term. Depending on when your house was built, there should be at least a few books available for full or limited preview! P.S. - I'm not too proud to admit that I'm not the world's best gardener. So if anyone wants to share gardening tips with me, I'm fair game! The other day, I came across this stone building at 16360 Euclid Avenue, on the border between East Cleveland and Cleveland, Ohio. I knew that this building was quite old, based on the way the stone appeared to have been worked by hand. The tooling was similar to the tooling of the stone on the Rodolphus Edwards house and the John Honam house (the Old Stone House, in Lakewood). I asked Roy Larick (of Bluestone Heights) and someone who has a particular interest in the historic geology of the region, and who has done considerable research into the Euclid Creek and Bluestone Heights area, about the house. I knew he'd be interested. He was interested, but confessed that he hadn't been able to learn much about it. The only information he had, other than a couple maps, was this paragraph on page 10 of A History of East Cleveland by Ellen Loughry Price. Sam Ruple and his family settled at Nine Mile Creek in 1805. The story is that the family had come from a Ten Mile Creek and considered this place a little less desirable than the old one-hence the name. He established a tannery there, later owned by the Luster family. The water from the creek was diverted into the basement vats of the stone house, and then out again into the creek. Mrs. Ruple fed a frightened run away squaw, and later fed and tried to delay a group of Indians in pursuit of her. But it was to no avail and they later returned with the captive. I looked and looked into Samuel Ruple, with little luck. I came to the conclusion that he did come to the area at about the time specified and did own a considerable amount of land around Nine Mile Creek. However, no evidence other than this passage was found to suggest that they were involved in the tanning business. The Ruple family appears to have been primarily farmers, and well-to-do ones at that. Plenty of evidence exists, however, documenting the Luster family as tanners, and operators of a tannery at this location. I believe that someone saw the tannery on the map, near the Ruple property, and connected the two. Samuel and Susan Luster were probably both born in Canada, in 1800 or 1801. The 1900 Federal Census, however, states that they were born in France and Ireland, respectively. Their first child, Samuel S. Luster (henceforth Samuel, Jr., was born on September 19, 1823, in St. Thomas, Ontario. They moved to Euclid Township at some time before the birth of Catharine Luster, in 1830. According to an obituary for Samuel, Jr., "As soon as the boy grew up he became a tanner and for many, many years, had a tannery on Nine Mile creek in Collamer." (Plain Dealer November 23, 1907, page 12). This would suggest that he became a tanner by the time he was 20 or so - 1843. It is not clear when he began to operate his own tannery. The 1850 Federal Census, which lists Samuel, Jr. as a "Tanner and Currier". It also describes Samuel Luster as a farmer. It notes several other children, George (18), Sanbarah (15), Elizabeth (12), and Harriet (7). 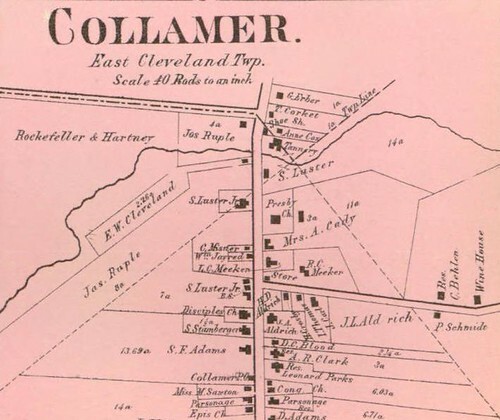 The 1858 Hopkins map of Cuyahoga County shows, about a third of the way from the bottom and a third of the way from the left, the property of S. Luster on Nine Mile Creek. It amounted to about 14 acres. 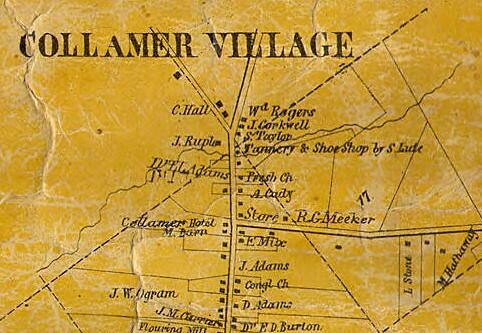 The detail on the map of Collamer shows a "Tannery and Shoe Shop by S. Lute". Given the similarity of the name to S. Luster, and because the County Recorder does not show any property transfers to anyone with the last name of Lute before 1927, we can safely assume that this was a typo for "S. Luster". The map shows the upstream extent of Luster's holdings, including quite a bit of Nine Mile Creek. It is unclear what the function of the other building on the property was. 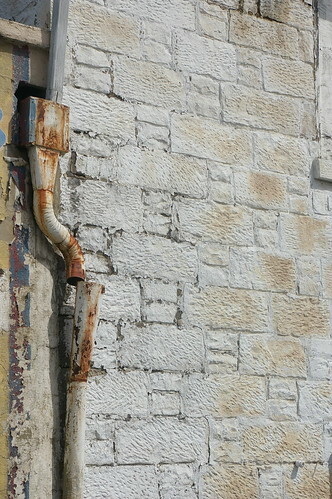 The construction of the tannery tells us quite a bit about the state of Samuel, Jr.'s business. It would have been expensive and time consuming to build from stone instead of wood. Most of the places where we see buildings built from stone, it is because it is readily available. The use of stone suggests that the tannery business was either already doing quite well or that he wanted to create the impression of importance, and was able to put the necessary time and labor into this. The 1860 Federal Census provides little new information. It lists Samuel Luster's occupation as "Master Tanner", owner of real estate worth $4,000 and personal property worth $2,000. The space for Samuel, Jr.'s occupation is blank. We can probably assume that they were working today running the farm, tannery, and possibly a leather-goods shop as well. Samuel, Jr. and Helen Ellsworth Luster married in 1863. Helen's parents were from Vermont, originally. 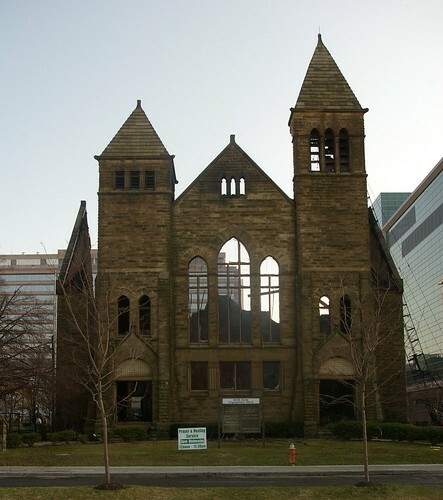 They remained in East Cleveland, where Samuel, Jr. built a house on the north side of Euclid Avenue, across the street from the First Presbyterian Church. (Plain Dealer October 4, 1954, page 28) This lot was purchased in 1866 from Henry Coit (AFN: 186605070006) and construction likely commenced shortly afterwords. Helen gave birth to 10 children, seven of whom were living as of 1900. Samuel Luster died in 1867, and was buried in East Cleveland (Township?) Cemetery. Susan Luster likely died between 1860 and 1870. The exact date is unknown. This 1874 map shows the Luster house, tannery, and farm, though not their vineyard, which would be just off the right edge of the page, on the north side of the road. Neither the tannery nor the vineyard are listed in the business directory for this map. 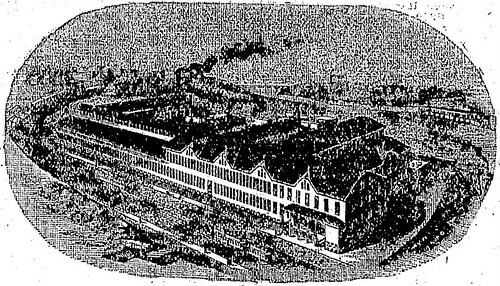 A building, owned by S. Luster, is shown on the plate covering the southern half of Euclid, in the 1892 Atlas of Cuyahoga County and Cleveland, Ohio, though it is not mentioned as a tannery. The 1903 Maps of Cuyahoga County outside Cleveland shows Ellen Luster owning the farmhouse opposite the First Presbyterian Church. It also shows the land that the tannery sits on being owned by S. Luster. Helen Ellsworth Luster died on the evening of Friday, October 29, 1905. The listing states that her residence was in South Euclid, but I believe this to be an error. The funeral was held in the residence on the following Monday at 2 pm. Samuel Luster, Jr. died from heart-related problems on the morning of Friday, November 22, 1907 in his residence in East Cleveland. (Plain Dealer November 23, 1907, page 12) The funeral was held the following Monday at 1 pm in his residence. He was buried in East Cleveland Cemetery. 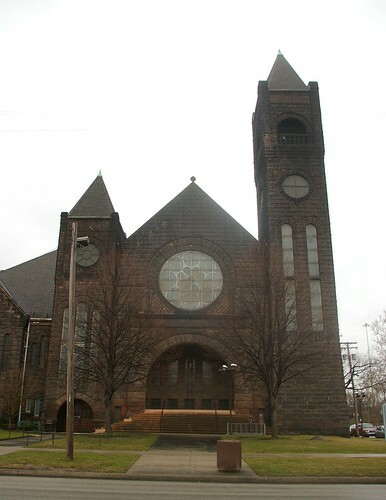 The Cleveland Necrology File lists the address as 14277, which is incorrect. I suspect this was an error, based on the pre-1905 address of 4277. The obituary describes him as a "pioneer tanner" and notes that at the time, he was the second oldest person in East Cleveland. It further noted that he was survived by five children: Bertram E. Luster of Euclid; and Ernest Luster; Mrs. C.W. Dille; Mrs. Norman Parks; and Mrs. W.W. Herron, all of East Cleveland. 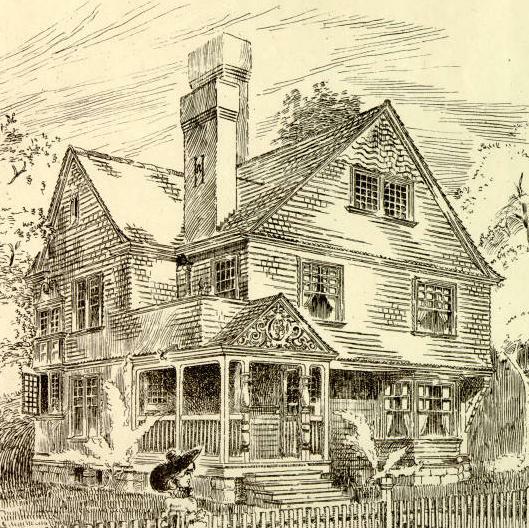 The Luster farmhouse was owned by E.W. Luster, as shown on the 1914 Plat Book of Cuyahoga County. There was a second house, next door, by that time. It is unclear when this structure last functioned as a tannery and became home to some other business. This image of the "Tannery at 9 Mile Creek" was published in A History of East Cleveland by Ellen Loughry Price (page 21). Based on the automobile, the photo was taken during or after the 1930s. 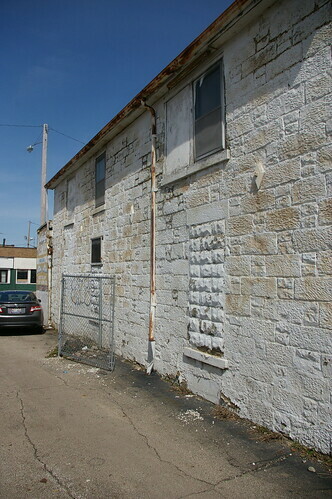 This view illustrates the south side of the tannery, now obscured by an addition, and another building, in the center of the photograph, which was also part of the tannery complex. The facade of the building shown here also provides us some clues as to what the side facing the street might have looked like. 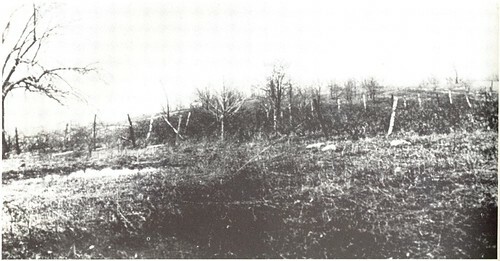 If the original photograph could be located, it would provide a wealth of valuable information. To summarize: This tannery was built by the Luster family as a tannery, between 1848 and 1858. It was likely built into the hillside, so that "The water from the creek was diverted into the basement vats of the stone house, and then out again into the creek." The land surrounding the tannery was used as a farm, which, combined, provided sufficient revenue to purchase additional land in 1870, which was used as a vineyard. The tannery is unique. 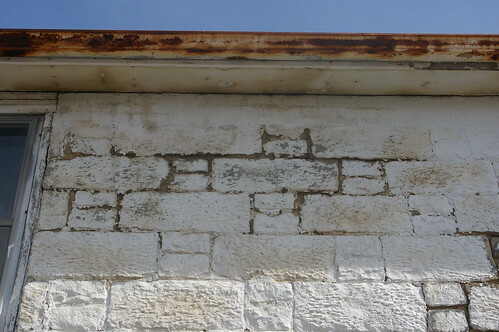 There simply aren't other stone commercial or industrial buildings of this vintage in the county. It is also special because of its size - the only stone buildings here of this vintage bigger than it are a few churches. This article is the first time, other than the brief mention in the paragraph cited above, that any mention of this building has been published in the last 50 years, and the first time anything more than a sentence or two has been written on it. The question now is as to what happens next. 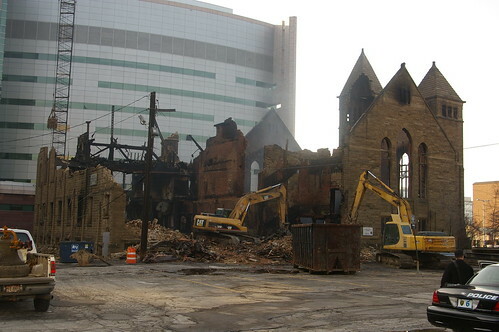 Taxes have not been paid on the Cleveland portion of the building since 1999, and on the East Cleveland portion since 2004. They amount to about $30,000. This would seem to coincide with a sale of the property to Immaculate Dry Cleaners. (AFN: 200401291006) The associated document states that Immaculate Dry Cleaners is incorporated in Ohio, and lists the president and contact agent as one John Iverson. The Secretary of State does not list any filings for a business under that name or with that individual as a contact. Given all this and that the building is boarded up, it seems safe to assume that, if it is to be saved, we must be the ones who act. This building appears to be in reasonably good condition, all things considered. Check out the full set of photographs of it and think of its potential. That the windows have been filled in is probably to our advantage, as it has afforded the interior some protection. This property is unlike any other in the area. It represents a significant point in the growth of Cleveland from a rural town to an industrial giant. There are few buildings representing early midsize industry. We need to evaluate the interior of this one and figure out how we can reuse it to catalyze the rebirth of this community and of Nine Mile Creek. March 29, 2010, 6:30 pm: Corrected amount owed in back taxes to $30,000, from $20,000. In 1977, a 22-year-old Case graduate and film enthusiast named Jonathan Forman put together the first Cleveland Film Festival (which has now evolved into the Cleveland International Film Festival). A native New Yorker, Mr. Forman had originally intended to bring the New York Film Festival to Cleveland, but when that didn't work out, he simply decided to do his own film festival. I recently had the opportunity to ask Mr. Forman, now President of Cleveland Cinemas, a few questions about that first film festival. Cleveland Area History: Is there one particular memory that stands out when you think about that first festival? Jonathan Forman: 34 years is a long time ago and my memory about specifics is fuzzy. But I do remember vividly my concern that the Festival receipts would be enough to cover all operating expenses. There was no funding. No corporate support. No sponsors. Everyone who helped me were friends and no one, including me, was paid. We had to have enough money to pay to rent the Cedar Lee Theatre (owned by Community Properties, not me), printing costs, mailing costs (snail mail, there was no email or internet marketing), film shipping and film rental were among the many expenses. We did break even, which was incredible. CAH: Which films did you show at the first film festival? How did you choose them? JF: We showed 8 films over the course of 8 weeks. Each film was shown twice, on a Wednesday and Thursday night at 8pm. It was more of a subscription series (patterned after a similar effort that American Express had done previously) as I was concerned that a traditional festival format of several days of film showings might not work in Cleveland. We opened with F FOR FAKE and concluded with a wonderful Italian comedy, MY FRIENDS. In between we showed XALA, from Senegal, The 11th INTERNATIONAL TOURNEE OF ANIMATION and others. It was an eclectic mix of films and people came and seemed to enjoy the mix. JF: Opening Night was great. The lobby of the Cedar Lee was packed with many local celebrities (all invited guests) and paying customers. Whatever food and wine that was served was donated. We had our own "specialty" concession stand where we introduced Russian Tea Biscuits and assorted cookies from Lax and Mandel, a local bakery, that have become a staple at the annual CIFF and at the Cedar Lee. CAH: In your opinion, how is the Cleveland of today different from the Cleveland of 1977? JF: The Festival today can't even be compared with what started it all. It is in fact what I fantasized about and thought it would be very cool if Cleveland could have a Festival with large crowds, lots of movies and enthusiastic and passionate movie goers--and just plain folks who like movies. Cleveland wasn't ready for that in 1977. But after laying the ground work, David Wittkowsky and now Marcie Goodman and their staffs, have turned it into something great that rivals the major Festivals in this country and around the world. Now that it is finally spring and we're all thinking about leaving our houses again, I thought I'd address the best public interior space in Cleveland, as well as one of the very best, if not the best, in the country. The Arcade, which runs between Euclid Avenue and Superior Avenue, was completed in 1890. It is a National Historic Landmark. The architects were George H. Smith and John Eisenmann. The space was created as a shopping center, with offices on upper floors. The Euclid Avenue entrance is higher than the Superior Avenue one, which effectively creates two main floors. This photograph was taken in 1965 by Martin Lindsey for the Historic American Buildings Survey (HABS). It shows the Superior Avenue façade prior to the installation of an architecturally insensitive canopy by the Hyatt Regency Hotel, which occupies part of the building. 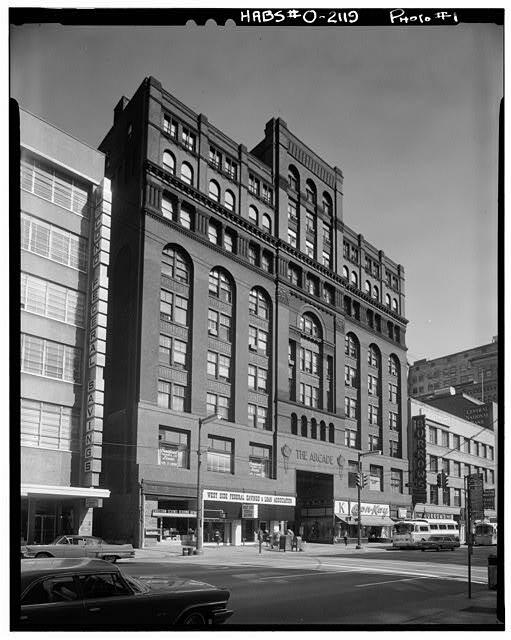 This photograph, also by Martin Lindsey for HABS, illustrates the Euclid Avenue façade. The first two levels were remodeled, with the polished marble seen here, in 1939. 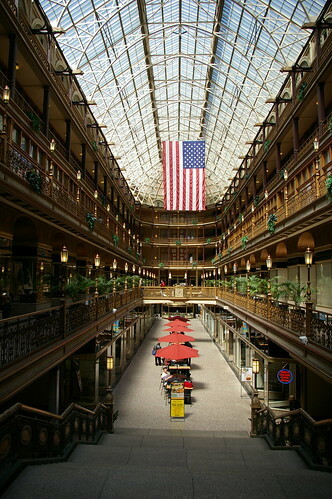 The Cleveland Arcade is a particularly noteworthy example of the skylighted arcade - a building type that is one of the most unique contributions of nineteenth century architecture to the urban scene. 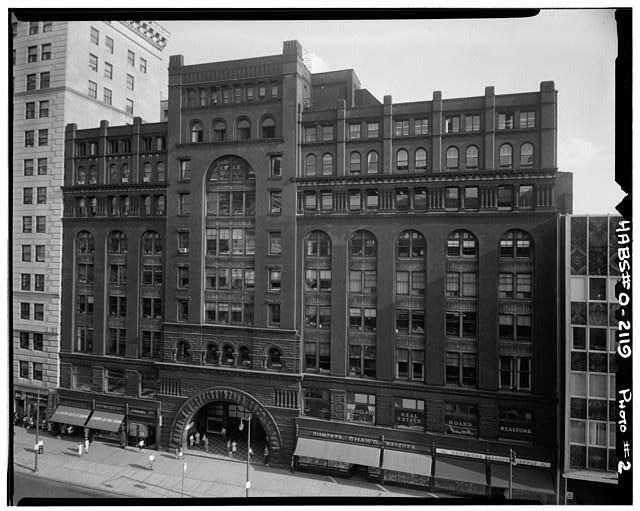 Functionally and commercially this prominent Cleveland structure is an arcade, for it provides a passageway between two large urban thoroughfares and it contains many shops and offices related to the individual companies. But its tiers of galleries and dramatic use of interior space make it architecturally more skin to the light courts of the multi-stories commercial structures which were developed before the introduction of sufficiently brilliant interior artificial lighting. In construction the Arcade is mixed in technique and materials and reflects the rapid changes in high buildings in the 1880s and 1890s - an era that saw the birth of the skyscraper. It's worth noting that they also have extensive documentation and architectural drawings of the Arcade, which will surely be of interest to anyone wanting to do further research on the building. This postcard, from the Cleveland Memory Project at Cleveland State University, illustrates the interior of the Arcade at night, in the 1920s. It shows the relatively small amount of light generated by the existing illumination sources, as mentioned above. As of this writing, the Arcade was currently working through the foreclosure process. If you haven't been in a while, stop the next time that you are in downtown Cleveland. If you go through it every day, slow down a little to enjoy it. I don't know what the best use for this space is. Stores now demand more space than they used to. Many businesses have left downtown. Whatever this space is used for in the future, it should be in such a way that allows for public access. The Arcade is the most architecturally significant building in Cleveland. It houses an incredible interior space. Let's find some way to take advantage of it. To better understand the significance of the Henry C. Holt residence at 1208 Kenilworth, designed in 1883 by Charles and Julius Schweinfurth, it seems worthwhile to discuss the history of the people who lived there. Ella Mary Holt was born October 4, 1856, in Chagrin Falls, Ohio. By 1880, Henry and Ella had married and were living in Cleveland, at 71 Jennings Avenue, now 2121 West 14 Street. Henry Holt was employed as a bookkeeper. The Holts had one child, Clara H. Holt, born October, 1879. They employed a servant and also had someone boarding with them who was also a bookkeeper. (1880 Census) A son, John W. Holt, was born February, 1886. Lamson and Sessions, a manufacturer, is still headquartered in the Cleveland area. I have to wonder, given that the company was originally from Connecticut, if there was some connection to them that brought Henry C. Holt to them here. 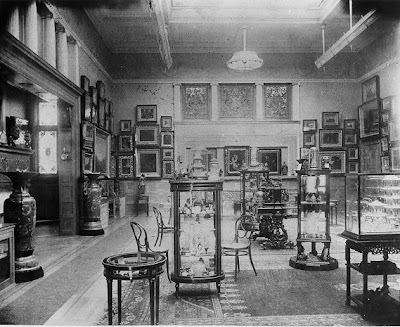 The Holt family moved into 94 Kenilworth Street, designed by Juilus and Charles Schweinfurth, in 1883 or 1884. The address was changed in 1905 to 1208 Kenilworth Avenue. The Lamson and Sessions factory, and presumably their corporate offices, were close to the house on Kenilworth - less than half a mile away. 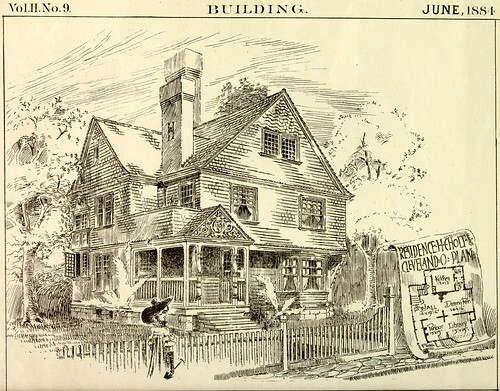 A brief mention of the commission for the house is given in The American Architect and Building News of November 24, 1883, stating simply, "Residence for W.O.B. Skinner and Mr. H.C. Holt, to cost, $9,000 and $5,000 respectively, are to be built from the designs of Messrs. C.F. & J.A. Schweinfurth." The commission of the Sylvester T. Everett residence, at 4111 Euclid Avenue is noted on the same page, with a cost of $200,000. The Holt residence may well be the least expensive house Schweinfurth ever created. It will surely reveal much about how he worked when faced with a budget. 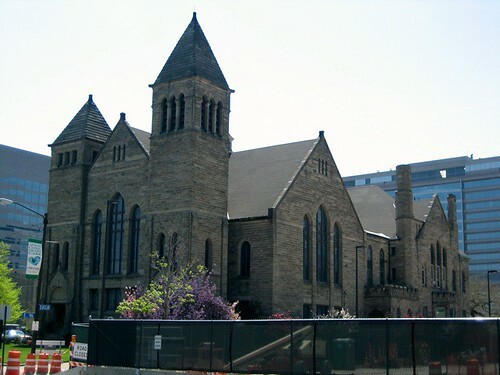 The Holt family were members of Pilgrim Congregational Church, at the corner of West 14th Street and Starkweather Avenue. Henry Holt served as treasurer there for a time. It is not known whether he had any influence in the choice of Sidney R. Badgley as the architect for this structure, completed in 1894. Henry Holt was a member of the Congregational club. (Plain Dealer, November 17, 1891, page 4) He was also a member of the Ohio Society, Sons of the American Revolution. Their 1897 yearbook lists him as the "Great-grandson of Reuben Hart, who was Ensign of 3d Company Alarm Lists, 15th Connecticut Regiment, 1777; Captain's Commission, dated May 28, 1778, signed by Jonathan Trumbull, Governor." The New England Society of the Western Reserve claimed him as a member as well. Henry C. Holt played a significant role in the local business community. Among other things, he is mentioned as a representative of Lamson and Sessions on a 1895 train chartered by the Cleveland Chamber of Commerce. They traveled to Atlanta to investigate business opportunities there. 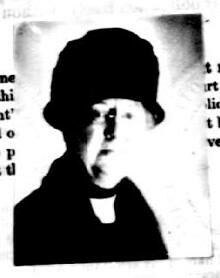 Ella Holt's name is listed frequently in the society pages of the Plain Dealer, as Mrs. Henry C. Holt. Henry and Ella Holt signed papers transferring the house on Kenilworth to the Ukrainian Greek Catholic Diocese on July 16, 1920. The transfer was recorded on November 20 of that year. The sale price is unclear, but it may be assumed that the property was sold, and not given, as the Holts were members of Pilgrim Congregational Church. Henry C. Holt died November 23, 1920. A funeral was held the following Friday at 2:30 p.m. in Pilgrim Congregational Church. It is not known whether his health was a factor in the transfer of the property to the Ukrainian Greek Catholic Diocese. In 1924, Ella Holt, at the time a resident of 1929 East 90th Street, applied for a passport. She stated that she intended to depart on January 16, 1924 and visit: the British Isles; France; Egypt; Italy; Greece; Switzerland; Algiers; Monaco; Palestine; Gibraltar; Holland; Belgium; and Spain. She returned to the U.S. on April 8, 1924, on the Olympic. She intended to travel further, as she renewed her passport on December 12, 1924, for an additional year. The extent of her other travels, if any, are unknown. This travel strongly suggests that she was still reasonably well off. The 1930 Census places her as a renter in the apartment building at 1961 Ford Drive, at the northwest corner of the intersection with Hessler Road. Ella Mary Holt died on April 25, 1950, at the age of 93. Her last address was 12407 Fairhill Road. The Cleveland Necrology File notes that she was grandmother of John Bradford Holt. The house appears to have been used by the Sisters of St. Basil as a convent from 1920 to 1936. They operated the house next door, 1202 Kenilworth, now the Ukrainian Museum-Archives, as an orphanage. Interior of 1208 Kenilworth. Plain Dealer, Thursday, May 8, 1941, page 28. Paul Holowczak was born in Galicia in 1894. He immigrated to the United States in 1904. As of 1920, he worked as a laborer in a furnace. (1920 Census) His first language was either Russian (1920 Census) or Ukrainian (1930 Census). By 1930, Paul owned a house at 2387 Professor Avenue, in Tremont. He used this as a funeral home, his own residence, and as a rental property. (1930 Census) The Cleveland Necrology File lists more than a hundred funerals at this address, though the data is limited both by what was pubished in the paper and by date - there isn't anything listed in it for this address before 1941. The date of the marriage of Paul Holowczak and Anna Pelechaty is unclear. It was sometime between 1930, when Paul is listed as single (1930 Census) and 1936, when their first child, Paul, Jr., was born. They had two more children, Peter and Joseph. 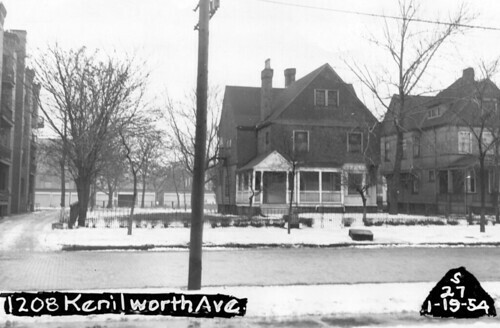 Paul Holowczak used 1208 Kenilworth as a funeral home and residence beginning in 1955. 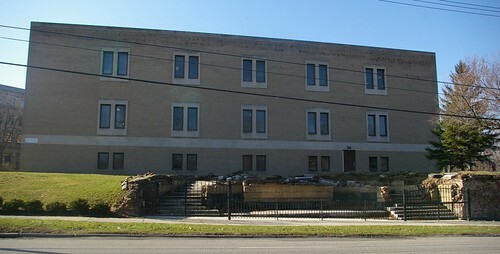 The Cleveland Necrology File records more than 400 funerals at this funeral home, though, as noted above, these numbers should indicate a very low estimate at best. Anna Holowczak continued to operate the business, presumably with the help of her sons. She died on June 13, 1985. Her funeral was held at the Holowchak Funeral Home, on State Road, in Parma. It is unclear when the Holowczak Funeral Home at 1208 Kenilworth closed or how long it has sat empty. Peter and Joseph Holowczak sold the house to the Ukrainian Museum-Archives in 2009. The house at 1208 Kenilworth has led an interesting history. 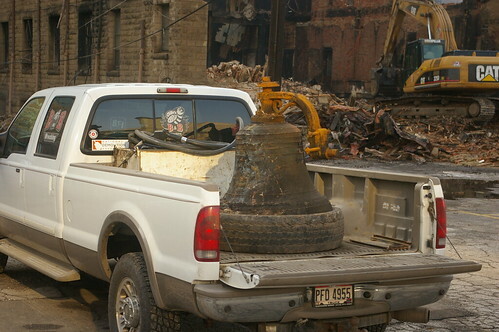 While it has never been the center of the Tremont community, it has played a vital role. For almost forty years, it was home to a single family. Then it served as a convent for about 18 years. 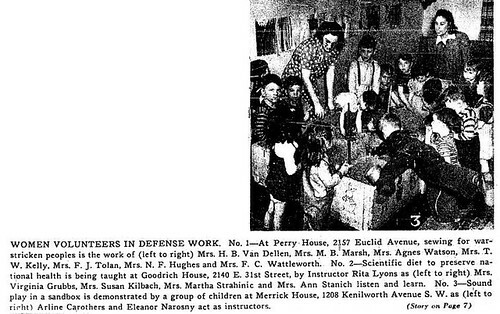 Next the house transformed into a day care center, surely creating fond memories for many of the children of the Tremont area. Finally, it became a funeral home and residence, for years providing a place for the residents to mourn the lost. This house, in addition to its architectural significance, has played an important role in the lives of many of the people in the Tremont community. You may do some drinking at the Old Angle tomorrow, but do you know where that name comes from? It comes from the Angle, an Irish neighborhood that developed on the West Side during the 1860s. The Angle was bordered by Detroit Avenue to the south and West 28th Street to the west, and followed Washington Avenue down to Whiskey Island. (Source: Encyclopedia of Cleveland History). Boxer Johnny Kilbane, who was born in the Angle, became the World Featherweight Champion on February 22, 1912. He returned to Cleveland on St. Patrick's Day, and was welcomed by a crowd of 200,000 people -- the largest public gathering in the history of Cleveland (at the time). (Source: Johnny Kilbane Official Website). 1954 photograph courtesy of Cleveland Public Library. 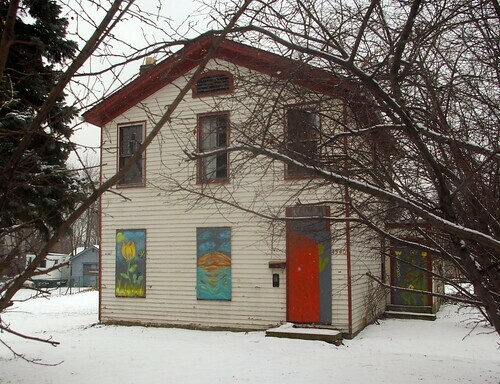 The Ukrainian Museum-Archive wants to demolish the house at 1208 Kenilworth Avenue in Tremont in order to provide 21 parking spaces. Rather than just complain about the proposed demolition of one of five surviving houses in Cleveland designed by architect Charles Schweinfurth, we should come up with a better solution. The Henry C. Holt residence, at 1208 Kenilworth Avenue, was designed by Schweinfurth in 1883. Of the 30 houses he designed in Cleveland, only six remain. Schweinfurth was one of the most significant architects in Cleveland in the 1880s and 1890s. He designed many of the great Euclid Avenue mansions. Among his notable commissions are the Union Club, the Cuyahoga County Courthouse, the beautiful bridges over Martin Luther King Jr. Boulevard, Trinity Cathedral, the Samuel Mather residence, and his own house. To that end, we're holding a design contest. We want you to come up with a better plan for the site, one that retains the Henry C. Holt residence. 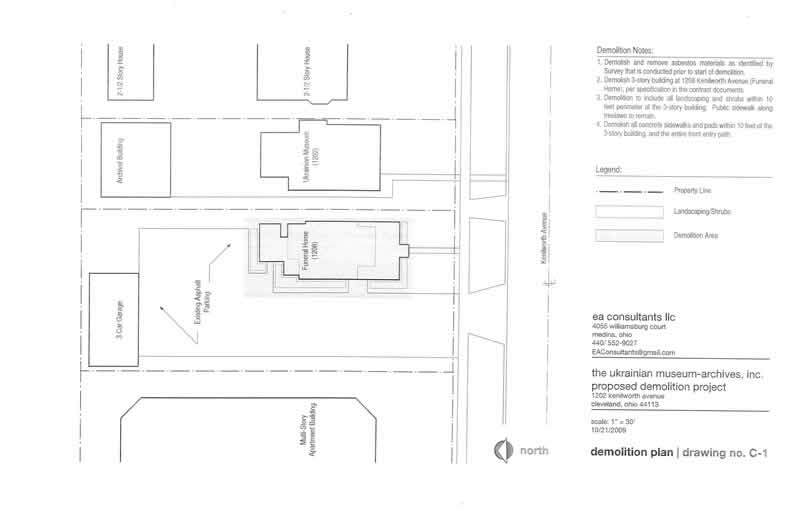 This is the proposed site plan, as prepared by Kulchytsky Architects for the Ukrainian Museum-Archive. It provides 21 parking spaces, including two handicapped accessible ones. 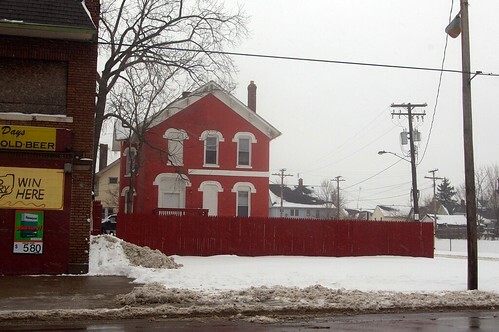 The property will be bounded by a wrought iron fence. A plan of the site as it is now provides a clear picture of the exact location of the buildings. Come up with the best plan for 1208 and 1202 Kenilworth Avenue (parcels 00412029 and 00412028, respectively) and you'll win two great books for your architecture / design collection. They are Shaker Heights: the Van Sweringen Influence by Claudia R. Boatwright (Shaker Heights Landmark Commission, 1983) and Shaker Heights Fences by Patricia J. Forgac (City of Shaker Heights, 1984). Entries must be recieved by midnight tomorrow. They should be emailed to ClevelandAreaHistory@gmail.com. 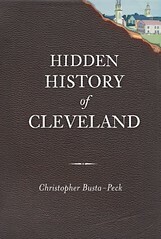 The "best" plan is entirely subjective and will be determined by the editors of Cleveland Area History. The best entry will shared here, as many any that seem interesting or noteworthy. 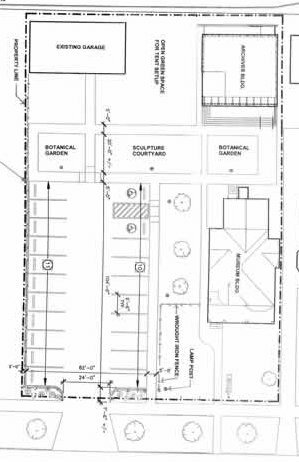 Further, designs may be presented, if possible, at the Landmarks Commission meeting on Thursday, March 11. All entries must include 21 parking spaces, including two handicapped accessible ones. Entries must retain the Holt house as well as the house at 1202 and the building behind it (the archives and museum, respectively). The historic photo of the house is available at higher resolution - it may be used in your plans. 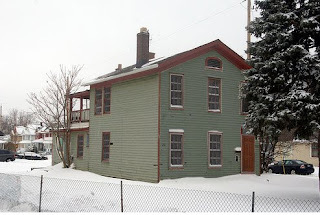 One item on the Cleveland Landmarks Commission agenda for this Thursday, March 11, is the demolition of this 1883 house at 1208 Kenilworth Avenue, in Tremont. It is known as the Henry C. Holt residence, after the man who commissioned it. Of the 30 houses in Cleveland designed by architect Charles Schweinfurth, this is one of only six that remain. Schweinfurth was one of the most significant architects in Cleveland in the 1880s and 1890s. Among his notable commissions are the Union Club, the Cuyahoga County Courthouse, the beautiful bridges over Martin Luther King Jr. Boulevard, Trinity Cathedral, the Samuel Mather residence, and his own house. 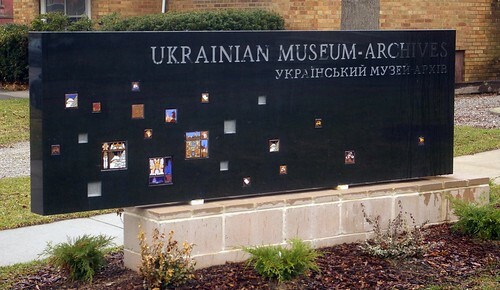 The house is owned by the Ukrainian Museum-Archive, which purchased the house in September. The Museum-Archive is housed and operated in the house and building on the adjoining property, 1202 Kenilworth. The museum wants to demolish the house so that they can use the land for surface parking. With the landscaping that they show in the plan, this would provide for 21 parking spaces. This house looks out over Lincoln Park - a view that was surely enjoyed by the residents for many years. It is now a bit worse for the wear - a conversion into a business left an insensitive brick addition on the front, encompassing the porch. The massive chimney, which provided visual balance, is also gone. These are not reasons alone to condemn it to the bulldozer. Too much of this area is surface parking. It seems that each and every business needs its own parking lot, and that they're never all full at the same time. There has to be a better solution. I encourage you to attend the Landmarks Commission meeting to share your feelings about this important residence. The meeting is this Thursday, March 11, at 9:00 in the 5th Floor Conference Center (room 514) at City Hall. While this may not be the absolute best residence designed by the man who built so many of the great Euclid Avenue homes, it's one of the few that remain. We can't afford to lose it. 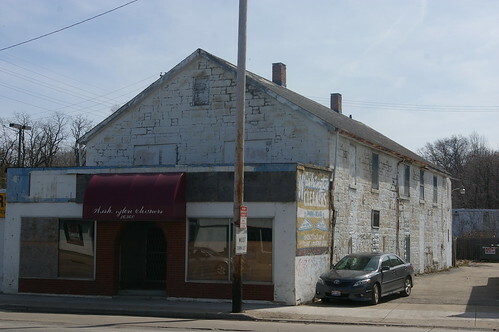 Another item on the agenda is the demolition of the long vacant Eton and Rugby Hall apartment buildings, at 7338 and 7342-50 Euclid Avenue. The agenda features numerous photographs of the buildings. They do have some nice architectural detail. I'm not familar with their interior condition. 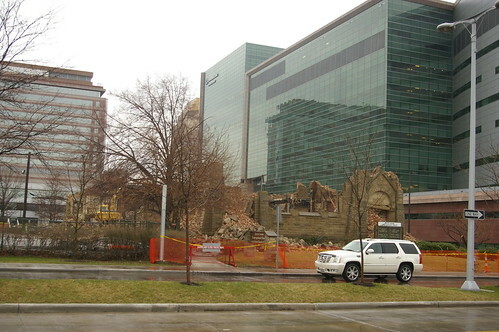 If they are to be demolished, I would like to at least see their architecturally significant elements salvaged. Finally, there are four buildings being nominated for landmark status. The nominees are three schools: Henry Wadsworth Longfellow; Joseph F. Landis; and Empire, and the Langston Hughes house that I've been working to help save. I hope to see you at the meeting on Thursday. 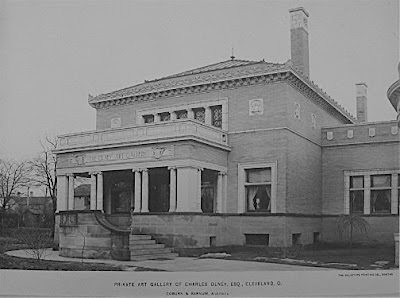 This house, at 2077 Campus Drive, in South Euclid, is the first porcelain enamel house in the world. It was built by the Ferro Corporation in 1932 as an experimental model home. The architect was Charles Bacon Rowley. Enameled steel or porcelain enamel was a new product in the late 1920s and early 1930s, used primarily for appliances like stoves. Ferro built this house to showcase some other potential applications. The design was said to be fireproof, which was a major selling point, used extensively in the promotion of this residence. This structure has tremendous historic significance. It was a major new idea in both housing and manufacturing, in a city that was still an industrial giant. While this wasn't indicative of where we have headed in residential construction, it was influential. Another house made of steel was completed in Solon soon after. 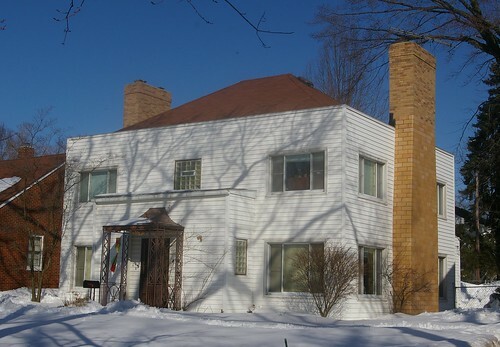 Ferro built, with Rowley as architect, this well documented house for the Century of Progress Exposition in Chicago in 1933, based on a similar design. Others tried their hand at this building material. After World War II, Lustron, of Columbus, Ohio, built prefabricated steel enamel homes and shipped them nationwide. This house has been altered considerably, with a new roof, replacement windows, and changes to the chimneys. Most significantly, the enameled exterior has been covered with vinyl siding. This is what you would have seen until a year or so ago at 9915 Miles Avenue, in Cleveland. Another nondescript single-story brick commercial building. This is the same spot today. The demolition of the commercial building on Miles Avenue revealed this circa 1880 brick Second Empire style house. The house, which the County Auditor lists at 4166 East 100th Street, appears to be in good condition on the exterior. Making it again visible to passersby on the main thoroughfare improves the quality of the streetscape as well as illustrating the past of this neighborhood and road. There are a surprising number of buildings like this in the greater Cleveland area. Most of the older roads have become major commercial routes, so residences become commercial properties. The commercial properties are usually physically connected to the residences, rather than being placed in front of them. We are at a point in time at which there are many buildings being considered for demolition within the city. We need to carefully consider which buildings we will save and which we will allow to be bulldozed. If there's only a slight commercial advantage to a business using a less interesting building, we should consider incentives to encourage them to save the more interesting ones. No one can dispute that Cleveland is a real food town. And our food scene is hot right now: you can hardly go anywhere without hearing about Michael Symon, Melt, the Greenhouse Tavern, brunch at Lucky's, and local and sustainable this, that and the other thing. Before the venerable Bookstore on West 25th closed last year, I had the good fortune to pick up A Clevelander's Guide to Dining in Cleveland (Eat Your Heart Out, Inc., 1983). This collection of more than 225 Cleveland-area restaurant menus provides a tremendous insight into the food trends of the early 1980s. 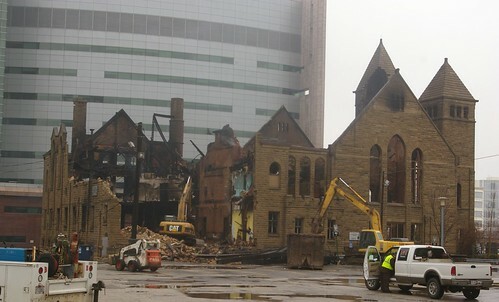 Which, to be honest, make me glad to be a Clevelander in 2010! Just leafing through this book makes me marvel at how much what we eat has changed over the past generation or so. 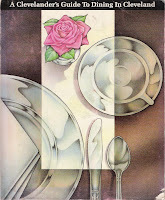 The 1980s were apparently not a good time to be a vegetarian, either: menus are dominated by veal, chateaubriand, something called Coquille St. Jacques, strip steak, and clams casino. As for side dishes, iceberg lettuce and sherried mushrooms, anyone? Or perhaps a nice Old Fashioned or glass of Lambrusco, which you could get for 90 cents at Teddi's. Further evidence of how things have changed: the guide is heavily skewed toward the East Side, whereas today, one might point to the West Side neighborhoods of Tremont and Ohio City as the epicenter of Cleveland's trendy food scene. (Although the fact that the publishers, Dennis Papp, Sherry Blackman, and Alex Russo, lived in Shaker Heights and Chagrin Falls, might also have something to do with it). The book, unfortunately, seems pretty hard to come by, although there appears to be a reference copy in the Special Collections department at Cleveland State (and a followup edition dated 1984, as well). In my opinion, this is just the sort of thing you should always pick up when you find it -- these are the little bits and pieces of history that often get forgotten, that may not seem very important, but which breathe life into history's people. 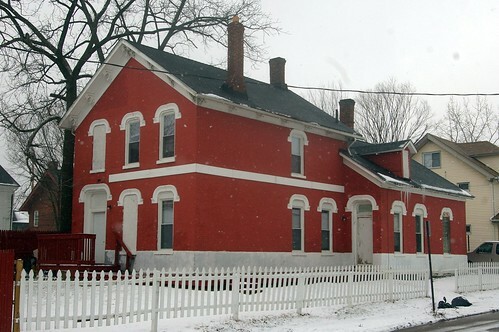 This nice, historic, circa 1850 Greek Revival farmhouse at 4340 Turney Road, in the South Broadway neighborhood of Cleveland has been lost. At 1900 square feet, it was larger farmhouses of that vintage in the city. Note the excellent proportions. A three pane transom was probably present over the front door. A vent graces the eave. The trim is simple and clean. A barn sat off to the left and would have likely looked similar to this one. This illustration by Shawn Hoefler shows what the house might look like once restored. The house appears to have been on the northwest corner of the property owned by one Thomas Garfield, who, at the time, owned at least 100 acres of land in the area. 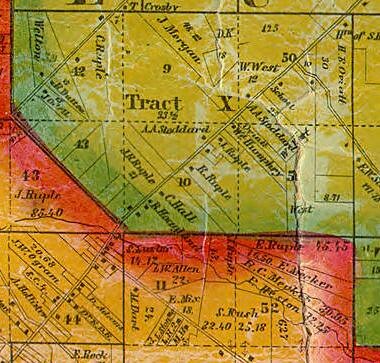 His holdings stretched from present day Turney Road on the north to Grand Division Avenue on the south, and were bounded on the west and east by Warner Road and Turney Road, respectively. I can't be absolutely sure of the date of the house, nor of this being it's original location, but I am certain that it was built before 1860. It was most likely built between 1846 and 1850. 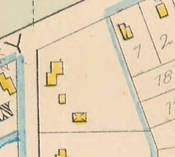 This 1881 map shows the house, on the corner of Force Avenue, to the left, and Turney Road. It shows small outbuilding and a barn. One addition was already present to the rear of the house, suggesting that it had been there for some time. In the time since this map was made, two more lots have been cut from this property on Turney Road and one more on Force Avenue. To clarify: this house has not yet been bulldozed. It sits, some windows broken out, slowly decaying. Unless we take action and convince city council to enact the necessary legislation, it will be lost. Until that time, this and so many other interesting structures should be considered lost. The problem is back taxes. The current owner, one William F. Hodges of 2846 East 128th Street, has not paid property taxes on this house since 2004. The back taxes now amount to more than $30,000. While the county can foreclose on a property after taxes haven't been paid in a year, in practice, it can take much longer - I know of one where property taxes haven't been paid since 1999. Given current policies granting homeowners some leeway with regard to back taxes, houses like this one will sit vacant longer and fall further into disrepair. While this house should be saved, no one is willing to pay $30,000 for it. Even $15,000 is likely too much. I haven't seen the interior, but I would guess that the cost of a reasonable rehab would be about equal to the market value of the property. We need a legislative solution. The problem is finding one that doesn't simply provide incentives for people to stop paying their taxes. I have no idea what this solution should be. We need to figure out some way to deal with this mess. Until we do, this house and so many others like it are lost.